Cole Newsome of Hillsboro High School wraps lights around the Christmas tree on the Highland County Courthouse lawn Wednesday afternoon. 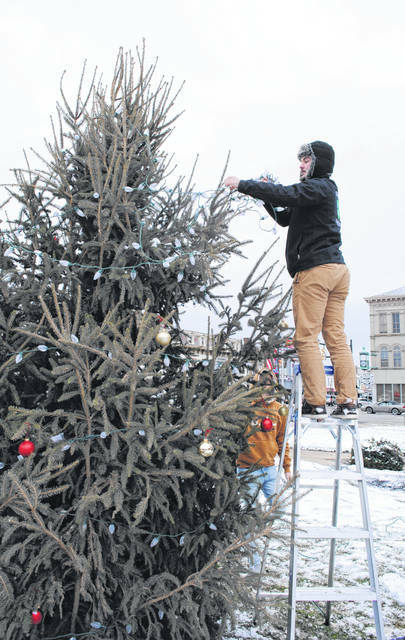 Newsome and other members of the Hillsboro High School Student Council braved cold and snow flurries to decorate the tree, which was placed in front of the judicial building earlier this week with help from Lerch’s Barnlot LTD staff. Before and after this Saturday’s Hillsboro Lighted Christmas Parade, which begins at 6 p.m., student council members will be selling hot chocolate for donations. All money raised will be used for the school’s Adopt-A-Family Christmas program next year.